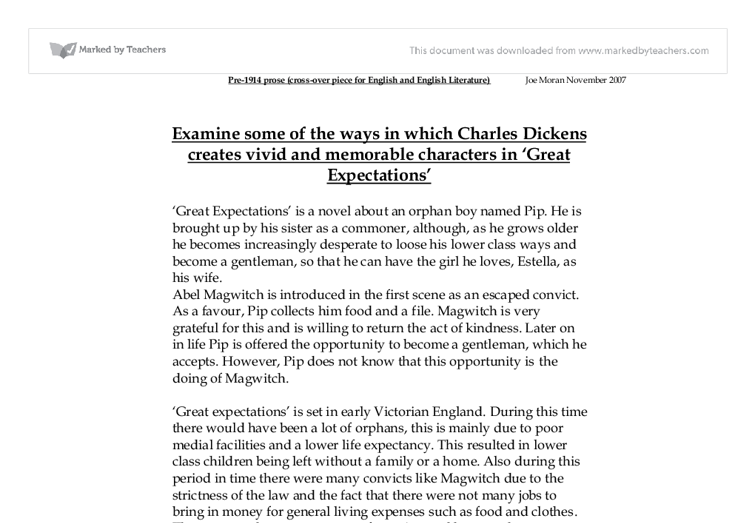 Examine some of the ways in which Charles Dickens creates vivid and memorable characters in 'Great Expectations' 'Great Expectations' is a novel about an orphan boy named Pip. He is brought up by his sister as a commoner, although, as he grows older he becomes increasingly desperate to loose his lower class ways and become a gentleman, so that he can have the girl he loves, Estella, as his wife. Abel Magwitch is introduced in the first scene as an escaped convict. As a favour, Pip collects him food and a file. Magwitch is very grateful for this and is willing to return the act of kindness. Later on in life Pip is offered the opportunity to become a gentleman, which he accepts. However, Pip does not know that this opportunity is the doing of Magwitch. 'Great expectations' is set in early Victorian England. During this time there would have been a lot of orphans, this is mainly due to poor medial facilities and a lower life expectancy. This resulted in lower class children being left without a family or a home. ...read more. Many things about Magwitch's unique appearance make him memorable and stay in your head. 'A man with no hat, and broken shoes.' In those days all gentleman wore hats and so this implies that Magwitch has not got much money and he isn't a proper gentleman. His broken shoes tell us that that he has had a rough time with them and he cannot afford a new pair. This again provides more evidence that he hasn't got much money. 'A man who had been soaked in water, and smothered in mud, and lamed by stones, and cut by flints, and stung by nettles, and torn by briars, who limped and shivered' Charles Dickens has described Magwitch in such a way, showing readers that Magwitch has had a hard time and he has had to travel a long way to get to where he is now. When he describes Magwitch as having 'a great iron on his leg.' it is describing a piece of metal around his leg that would have been put there to stop him escaping. This consequently tells us that he is an escaped convict. ...read more. He gives them very extreme personalities which are made to scare you, make you feel unhappy, happy etc. The emotions that these characters give you make them memorable. The unique appearances of his characters help you create a vivid picture of them. 'He had iron grey hair' this makes you think of a worn down man with silvery, tough hair. It is unique because you wouldn't expect anyone to have such a description of hair. He gives them broad accents and makes them speak strange dialects so that you do not forget them. 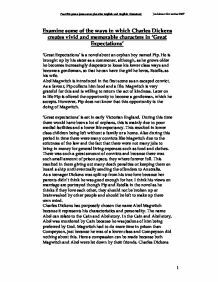 The character Magwitch is very memorable, and Dickens makes you feel as if he is going to be a horrible character and that he is going to be part of an evil plot. But after chapter thirty-nine you begin to realise that he was a desperate individual that had no choice but to threaten and blackmail Pip. He shows that Magwitch has a good side to him when he returned the favour to Pip by being his secret benefactor. You also learn that it is not all Magwitch's fault for the crime that he committed, because Compeyson played a big part in it too. ?? ?? ?? ?? Pre-1914 prose (cross-over piece for English and English Literature) Joe Moran November 2007 1 ...read more. shot acting as the shark, watching the kids swimming and splashing around, the suspense soundtrack immediately starts quite loud; this suggests that the shark is already quite closet creates a lot of tension and . As the music gets louder and faster the camera gets closer and closer to Alex on the lilo.